Located in Northeast Baltimore, Chinquapin Run is a 76-acre stream corridor and City park buffered by natural green space and segments of recreational area. The park follows the serpentine course of the Chinquapin Run, flowing southeasterly for more than two miles and situated just below the city limits, close to Towson, where it is met by the Northern Parkway and Glen Oaks, Chinquapin-Belvedere and Lake Walker neighborhoods. Perring Parkway and Morgan State University mark the southern terminus of the park. Toward the top section of Chinquapin Run Park, you’ll find great family-oriented recreation amenities such as the playground area and tennis court. Below that section begins a large swath of rolling, open park space occupied by a soccer pitch, two grass ballfields and a basketball court. The southern section of the park is met by Northwood Elementary School and rec center, offering additional basketball courts and play areas. 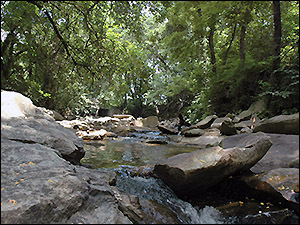 Chinquapin Run Park is an important environmental asset. It serves as a major tributary to the Herring Run, part of the Back River Watershed, and one of Baltimore’s three major stream arteries. Chinquapin Run meets the Herring Run stream valley at a confluence around Mount Pleasant Park to its east, where it continues south toward Clifton Park. Along its riparian curvature, Chinquapin Run has rich natural foliage with dense tree cover and lots of plant life. The park proves to be a great setting for any number of activities, ranging from dog walks, nature hikes and photo outings to picnics and adventures along the stream valley. It’s also a great place—and sight—to observe fall’s changing colors of the leaves. Bring your camera!